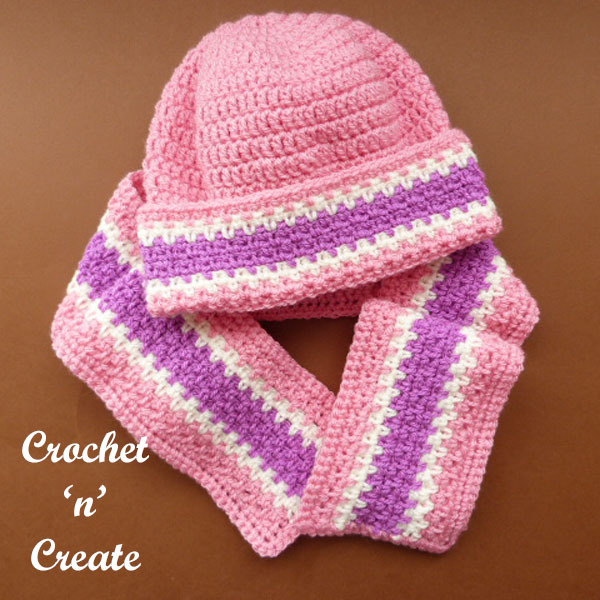 Childs Woven Scarf-Hat Free Crochet Pattern – My last free crochet child’s hat and scarf pattern proved to be so popular, that I decided to design another. 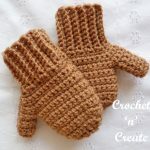 The one is in an easy woven stitch and is very quick to crochet up. 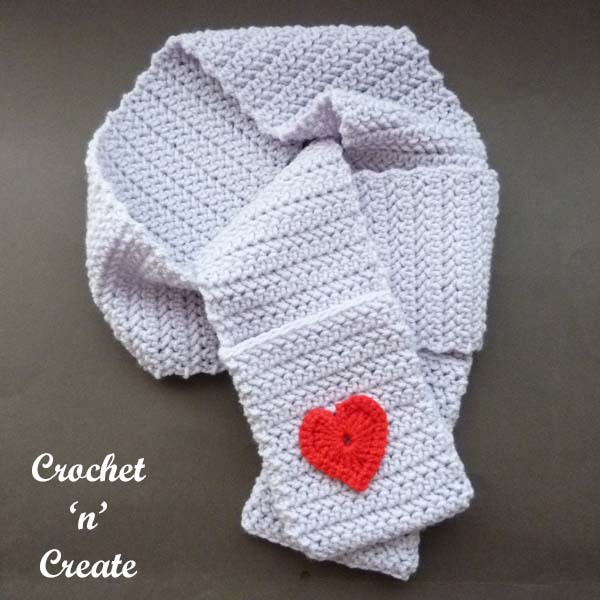 This entry was posted in crochet child scarf & hat, crochet scarves and tagged crochet, crochet hats, crochet scarf, free pattern on 27th October 2018 by crochetncreate. 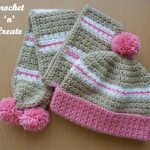 Childs Woven Scarf-Hat UK Free Crochet Pattern – Nice easy child’s scarf and hat pattern, made in DK yarn with a double crochet woven design. 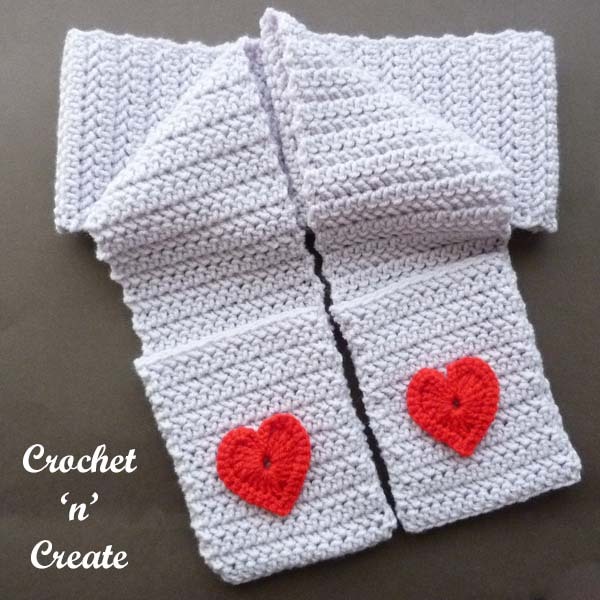 See more of my free baby and children’s winter warmers with the links below. # 2nd Row – 1ch, 1dc into base of 1ch, * make 1ch, miss 1dc, 1dc into next dc, * rpt from * to * to end. Turn. 3rd Row – 1ch, 1dc into base of 1ch, * 1dc into next 1ch space, make 1ch, miss 1dc, * rpt from * to * to last dc, 1dc into dc. Turn. Rpt 2nd & 3rd Rows once. Rpt 2nd & 3rd Rows Twice. Rpt 3rd & 2nd Rows. Rpt 3rd & 2nd Rows. Turn. 15th Row – 1ch, 1dc into base of 1ch, 1dc into each 1ch space and dc to end. Turn. 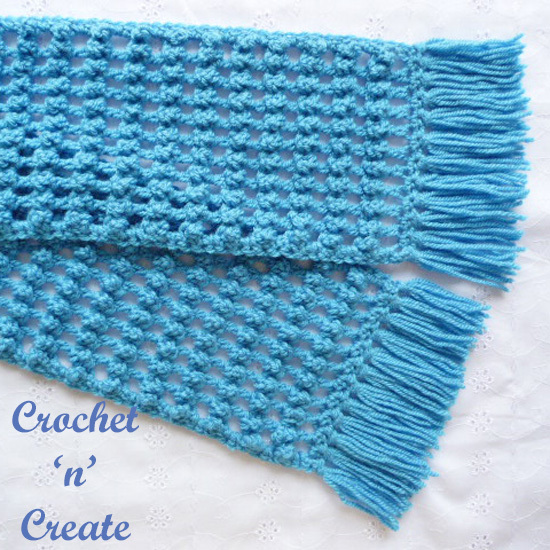 Border – 1ch, 1dc into base of 1ch, 1dc into each dc to last dc, 3dc into corner, 1dc into each row end down first side of scarf, 3dc into corner, 1dc into each ch along starting ch edge, 3dc into corner, 1dc into each row end up second side of scarf, 1dc into corner, ss to first dc. Fasten off. 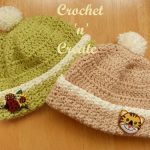 Hat – Made in rounds without turning until the brim. 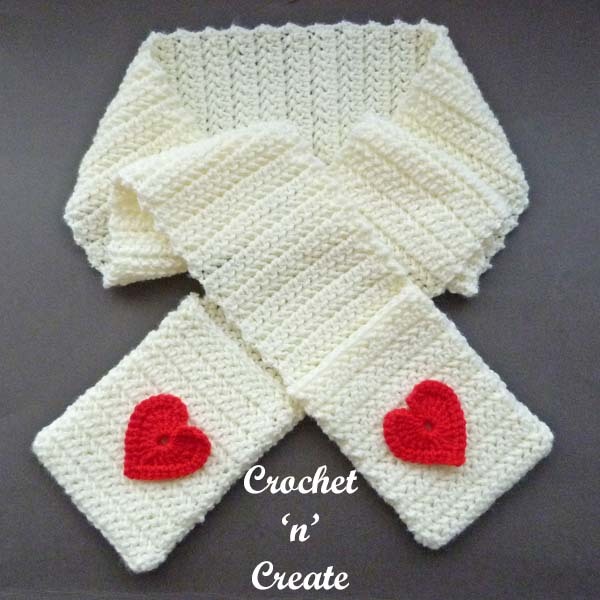 7th Round – 3ch, 1tr into each tr to end, ss to top of the 3ch on the beginning of row. Rpt the 7th Round until you have worked 16 rounds in all from the beginning. Turn. 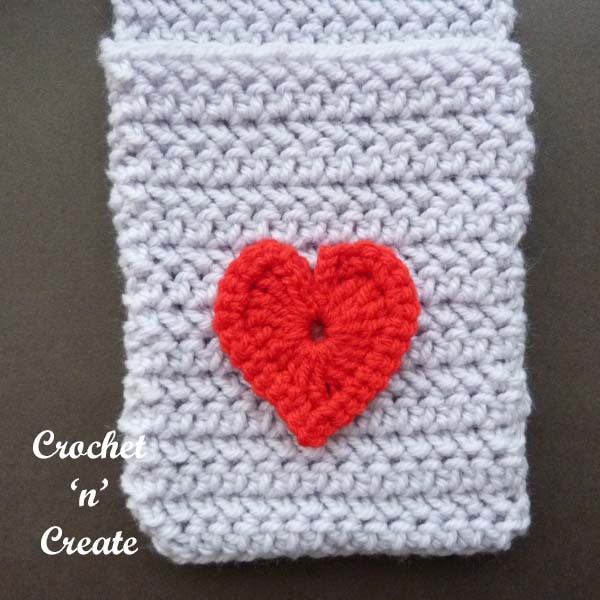 Brim – Change to 5.50mm hook, working into back loop of stitch only for this round, work 1ch, 1dc into base of 1ch, * make 1ch, miss 1tr, 1dc into next tr, * rpt from * to * to end, ss to first dc. Turn. Second Row – Working through both loops of stitch from now on, make 1ch, 1dc into base of 1ch, * make 1ch, miss 1dc, 1dc into next 1ch space, * rpt from * to * to end, ss to first dc on beginning of row. Turn. Third Row – 1ch, 1dc into base of 1ch, * make 1ch, miss 1dc, 1dc into next 1ch space, * rpt from * to * to end, ss to first dc. Turn. Fourth Row – Rpt Third Row. 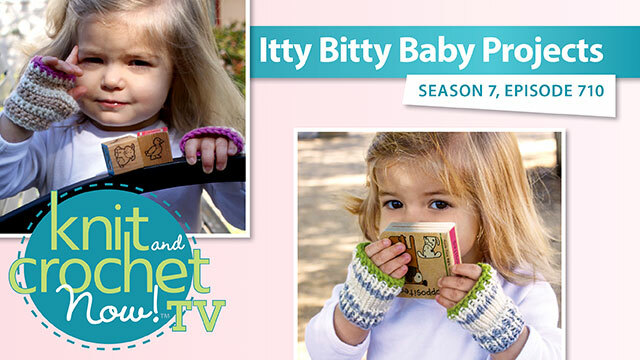 Fifth to Ninth Row – Rpt Third Row. Tenth & Eleventh Rows – Rpt Third Row. Twelfth & Thirteenth Rows. – Rpt Third Row. 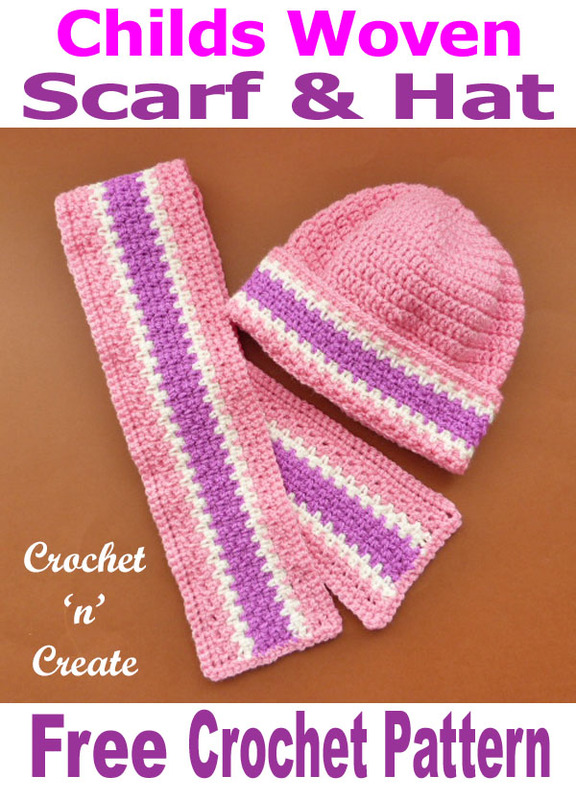 Finishing – Weave in and trim off all loose ends of yarn, fold brim onto front of hat. Tip!! 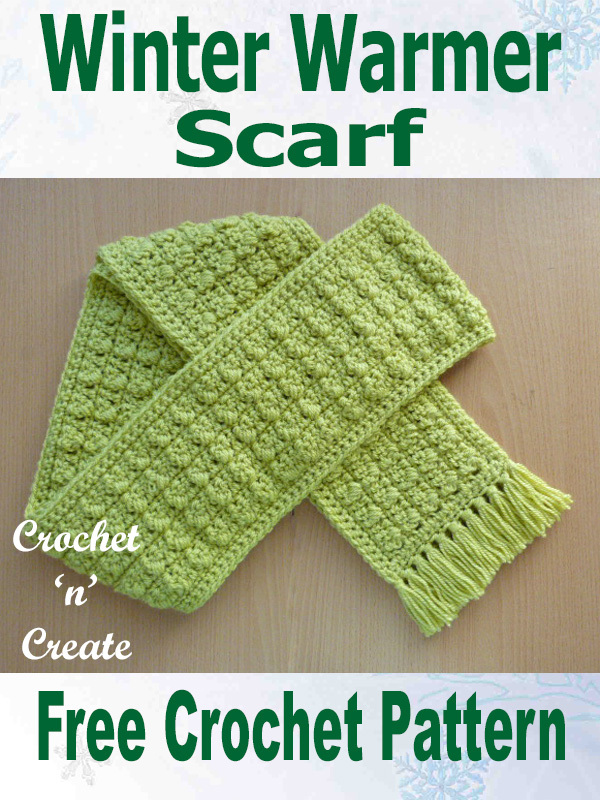 – To make the scarf and hat bigger, you can use larger hook sizes and thicker yarn. 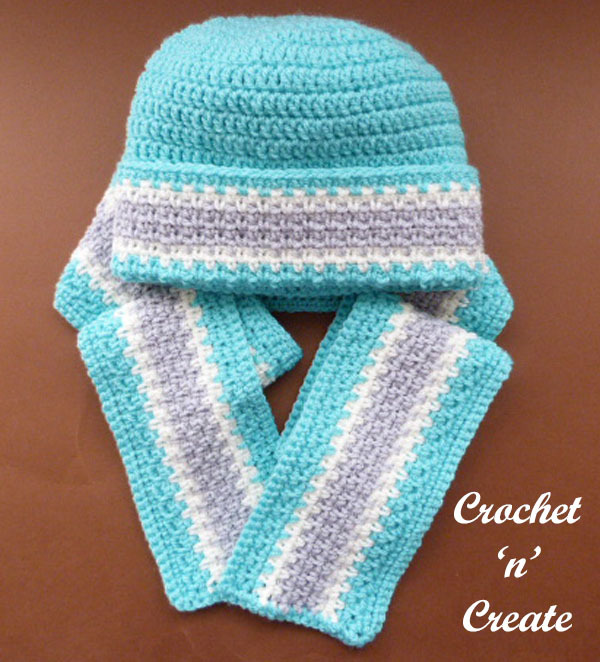 The written instructions and pictures for this childs woven scarf-hat uk free crochet pattern are copyrighted to crochet ‘n’ create © 2017. 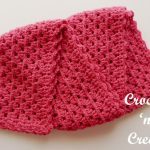 You are welcome to sell the finished products made from the childs woven scarf-hat uk free crochet pattern, I just ask that you please use your own pictures and put a link back to crochet ‘n’ create. 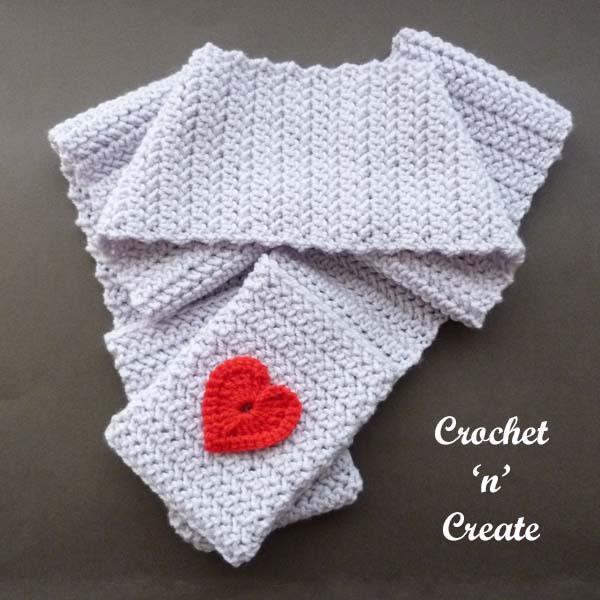 If you wish to share this sweet childs woven scarf-hat uk free crochet pattern on your social media or your blog please only use a direct link to the pattern page on crochet ‘n’ create. 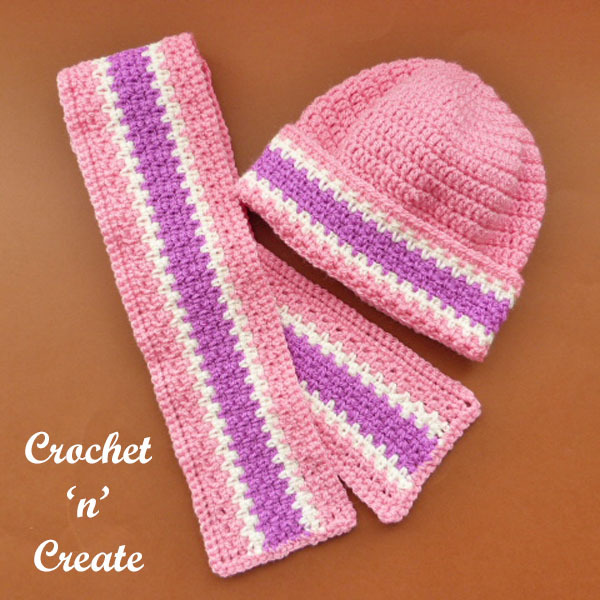 This entry was posted in beanie hat, crochet child scarf & hat, crochet scarves and tagged crochet, crochet hats, crochet scarf, free pattern on 27th October 2018 by crochetncreate. 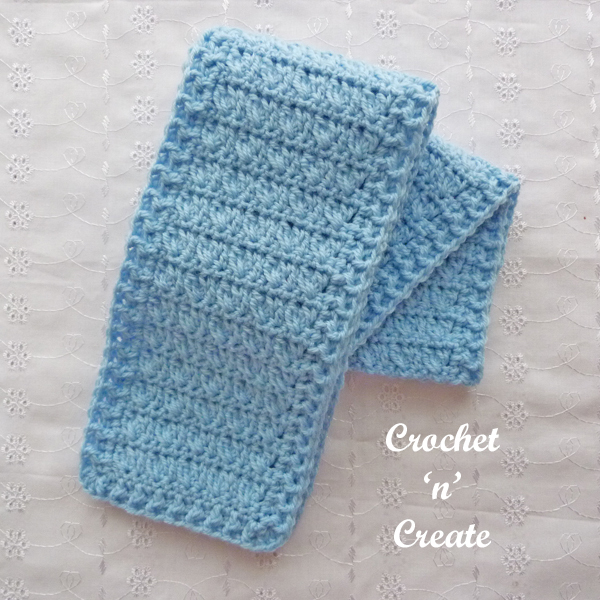 Free Crochet Pattern-Winter Warmer Scarf UK – Quick and easy winter scarf, made in textured combo stitch, as long as you have the basic knowledge of crochet stitches you will fine with this pattern. 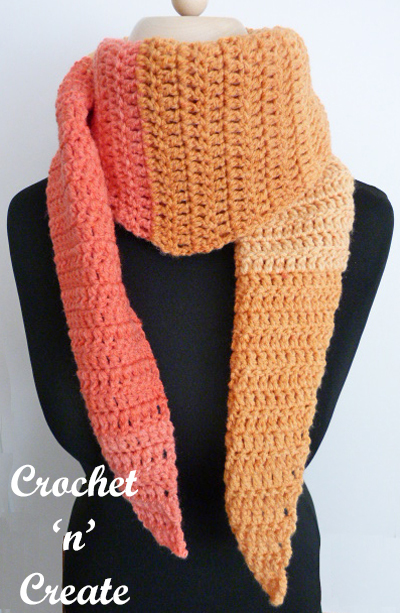 Hope you enjoy making this lovely warm scarf to keep out some of the elements lol. 3rd Row – 1ch, 1dc into base of 1ch, 1dc into each cl and tr to end. Turn. Repeat the 2nd & 3rd Row four more times. Turn. 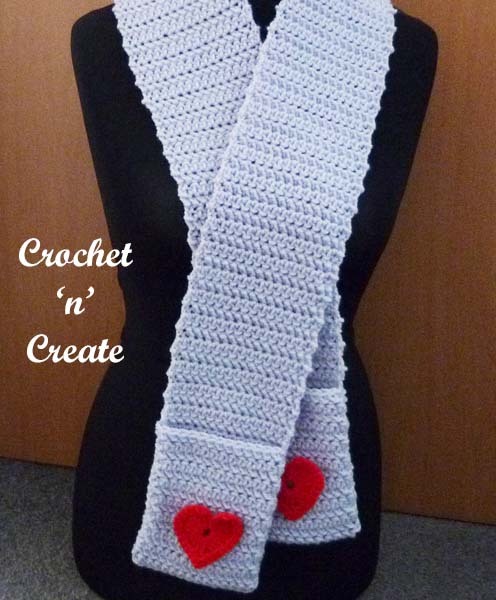 Border – 1ch, 1dc into base of 1ch, 1dc into each dc across, work 3dc into the corner, 15dc evenly into row ends down first side of scarf, 3dc into corner, 1dc into each ch along starting ch edge, 3dc into corner, work 15dc evenly into row ends up second side of scarf, 1dc into corner, ss to first dc. Turn. Work 1 more row of 1dc into each dc around scarf to end, working 3dc into each of the corners and slip stitching to first dc at the end of row. Fasten off. 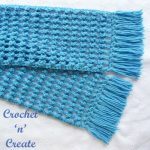 At each end of the scarf with RS facing thread tassels in alternate sc’s, by folding each tassel in half and threading the open ends of the tassel through each sc, pull through the loop you have created and secure, trim to make even. 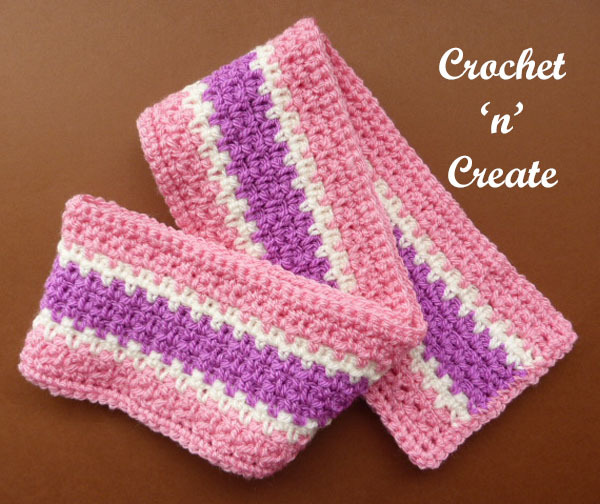 Finishing – Weave in a trim off any loose ends of yarn. 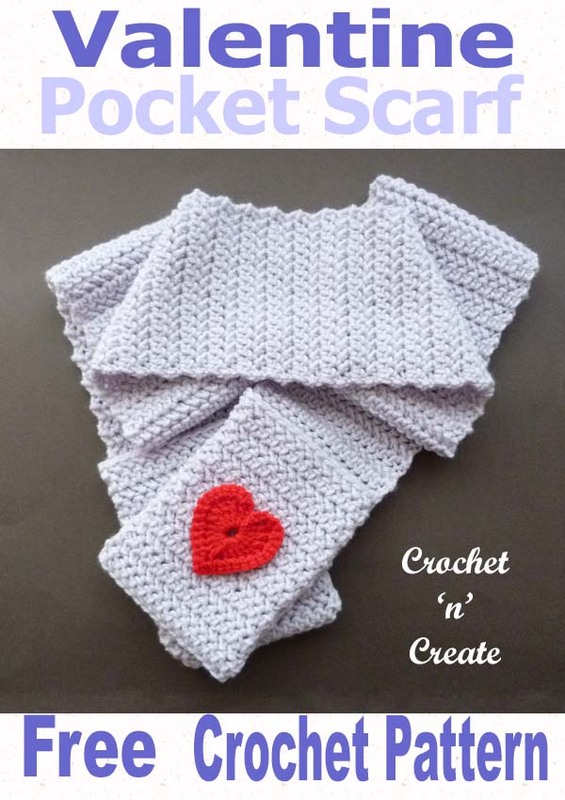 The written instructions and pictures for this free crochet pattern-winter warmer scarf uk are copyrighted to crochet ‘n’ create © 2018. 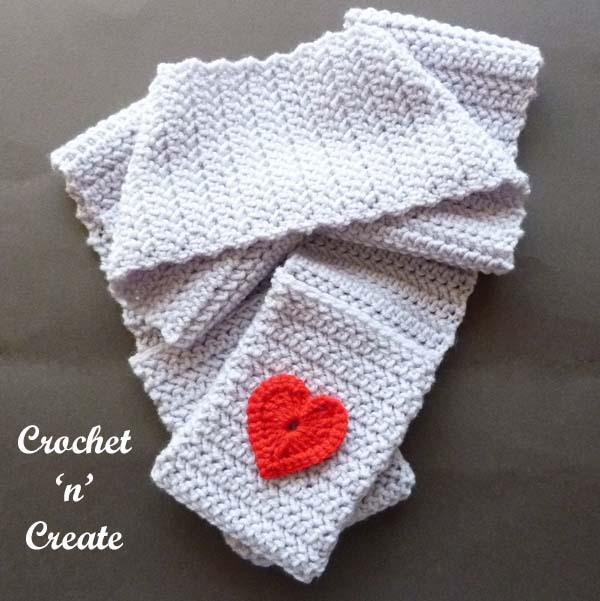 You are welcome to sell the finished products made from the free crochet pattern-winter warmer scarf uk, I just ask that you use your own pictures and put a link back to crochet ‘n’ create. 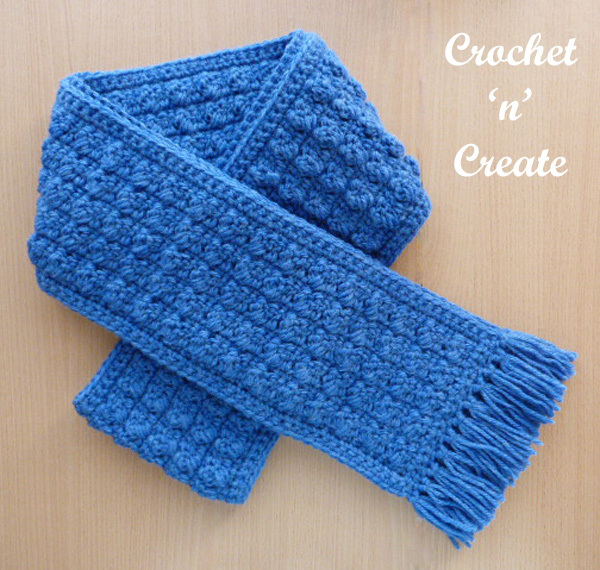 DO NOT share the written instructions for this free crochet pattern-winter warmer scarf uk. 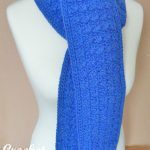 Crochet Scarves Roundup – Get ready for the Winter chill with this selection of easy stylish scarves, make for gifts, to sell or just for yourself. 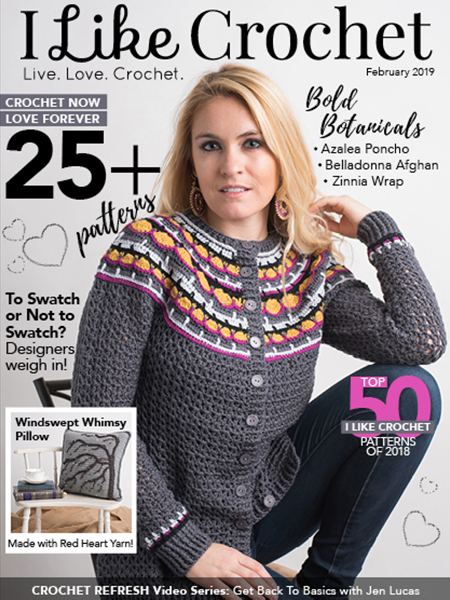 Click on the heading or the picture below to get each of the patterns. 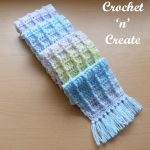 This entry was posted in crochet scarves, Round Ups and tagged crochet, crochet ladieswear, crochet roundup, crochet scarf on 14th August 2018 by crochetncreate. 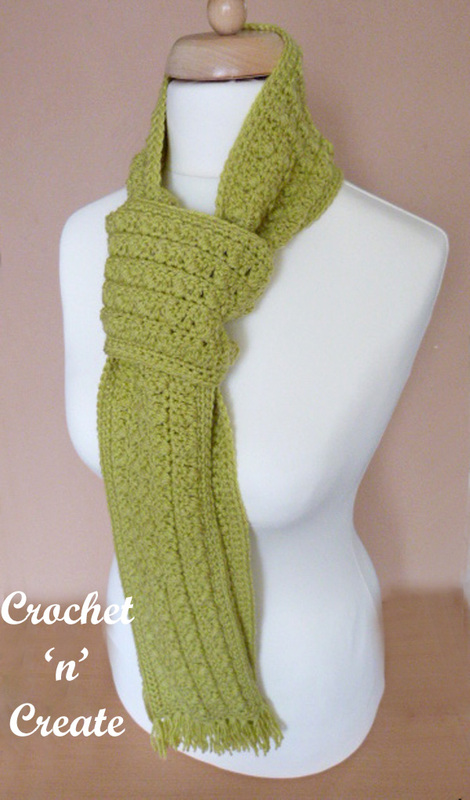 This crochet beginners scarf is made in a basic double crochet stitch from beginning to end, it includes simple increasing and decreasing stitches. 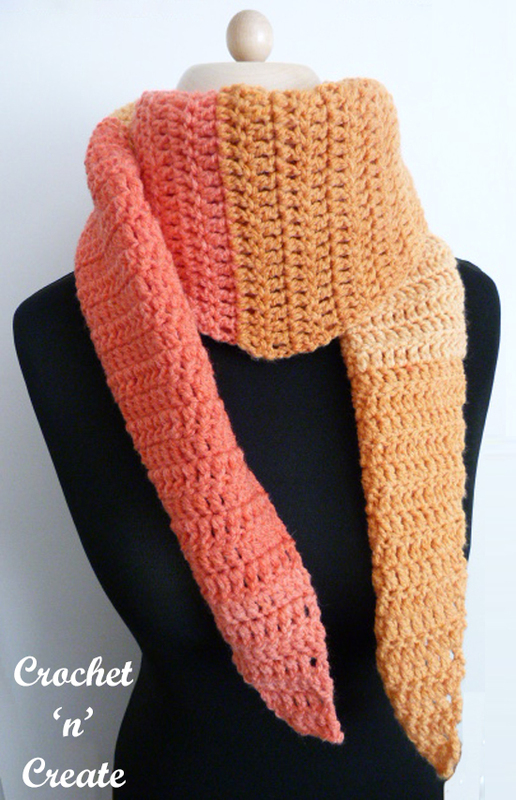 If you are out and about on a cool summer evening it is ideal to throw around your neck. 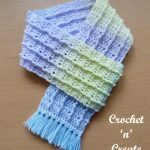 This entry was posted in crochet ladieswear, crochet scarves and tagged crochet, crochet ladieswear, crochet scarf, free crochet patterns on 15th May 2018 by crochetncreate. 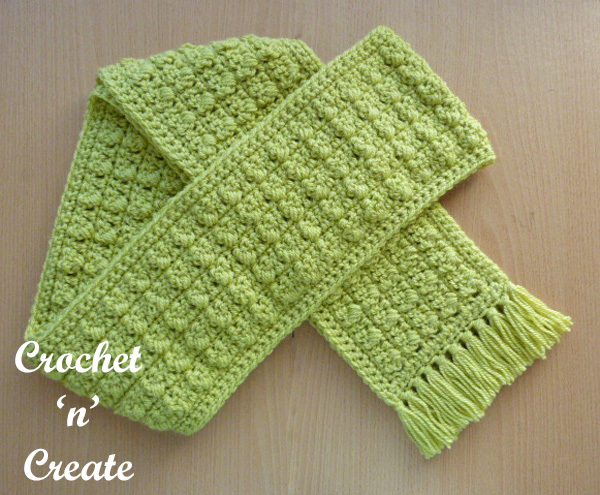 End of season crochet filet bobble scarf, I have combined some lovely stitches for this scarf, the open filet and bobble effect on this scarf when crocheted on a 5.50mm hook creates a light and soft feel. 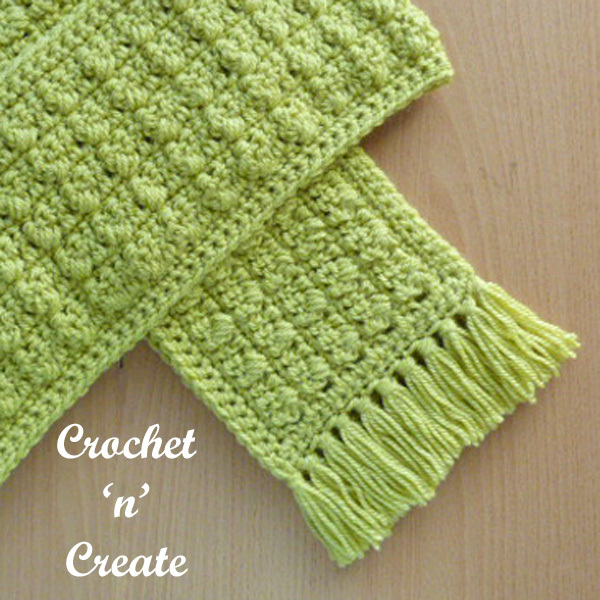 Made using chain spaces, dc, trc and sc.